We have our eye on a smaller house, so my big New Year's resolution was to go through my stuff and try to pare down. I'm one of those people who has a hard time getting rid of things, and I come from a long line of pack rats. I am the keeper of many generations of pictures, papers, and other memorabilia. It's hard to know where to start. And, oh, the detours that beckon. I've been going through piles, and it isn't pretty. My current storage system doesn't discriminate between historical document and whimsical keepsake. I find my grandfather's original citizenship papers sandwiched between a funny birthday card from my aunt and a ticket stub to a Sly and the Family Stone concert. I have to get a system if I am ever going to live tiny. So I make piles from the piles, inventing categories as I go: Family History. Exercise. Travel. Finance. Health. Letters. House. Pictures. Trash. Recycle. Cute Things My Daughter Made. The Dreaded Miscellaneous. And then, either because I'm tired of sorting or I've been thinking about my father lately, I exit at Dad's Army Stuff and get lost for quite a while. 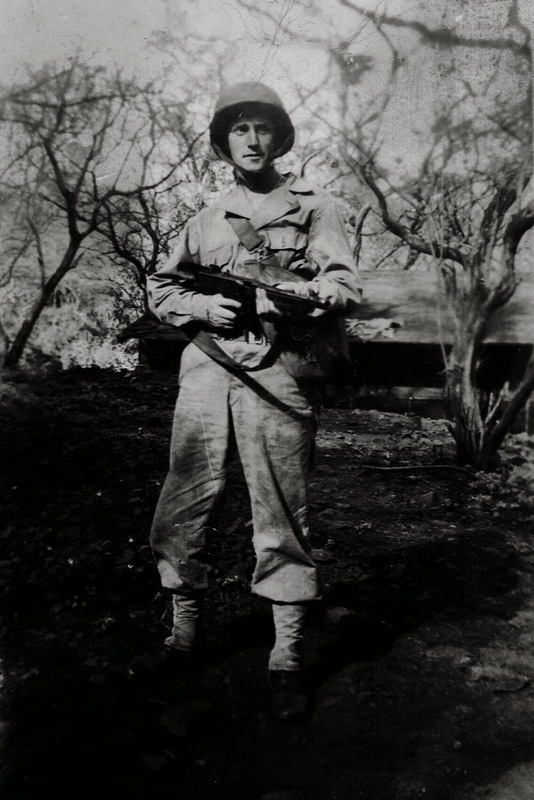 Staff Sergeant William Francis Langton fought in the Pacific in WWII, and I know by heart the few stories he told about combat. But I find a book in the folder about the Battle of Saipan that came out just after he died 11 years ago. The author sent a copy because my dad gave him some material for the book. In my sadness at his death, I had never brought myself to read it. So I settle in, to see if a stranger can tell me something more about the life of the man I miss so much. I get more than I bargained for. The author is the nephew of a lieutenant colonel in my dad's infantry regiment who was killed on Saipan. He interviewed hundreds of old soldiers for the book, and their memories give a human face to the grim strategies and statistics. The details are excruciating, and it is harder still to realize my dad saw and did what is described. That gentle man carried a horror inside that he hid from all who loved him. For the rest of his life, it bonded him to his fellow fighters. Those who survived knew all too well the tale of their Bronze medals earned on Saipan. They met at reunions for years to keep the memory alive, or to make it bearable. I'm not sure which; maybe a bit of both. It has grown dark and chilly, and my legs are cramped. I tuck the book away, and peek in one more tattered manila envelope with my dad's blocky scrawl on the front: “The Guys.” Inside are typed sheets, over 60 years old, with names of his whole company. They are scribbled with notes about Christmas cards sent and addresses changed over the decades. I used to help my dad write those cards so long ago. One by one their names were crossed off, until no one was left to keep a tally. I put the yellowed sheets back into the envelope, and place the envelope in a pile by itself. I call it, simply, To Keep. Thanks for your comment. I often wish the dads were here to join us on the detours and fill in the blanks. My own paring down,........ started with ripping out the carpets and replacing them with hardwoods. My "plan" was to go thru all my stuff and keep only the essentials. But of course , I ran out of time and 2 days before the contractor arrived, packed up EVERYTHING and moved it into storage. It was a task, but I didn't have time to sort it out. Now I've gotten used to living the minimalist lifestyle and although I do INTEND to sort thru it all, It grows less important everyday. Turns out, you don't need as much "stuff" as you think. Jeff, That is an interesting technique, "out of sight, out of mind." I may have to resort to that.